With a lot of high drama expected next year, we give to you a look ahead, forecasting some of the biggest political battles which will be fought in 2018. No doubt, 2018 will witness a renewed intensity of political activities since the year precedes the election year. Already, the announcement of the dates for the 2019 general elections by the Independent National Electoral Commission (INEC) has given a shot in the arm of political events, prompting events and secret meetings and others. While these are only some of the biggest battles to be fought, the Nigerian political landscape has a knack for serving up brand-new drama and intrigues. Here, we give to you - in no particular order - the major events that will dominate in the year 2018. One of the biggest political battles of 2018 will be the aggressive race to secure the presidential tickets of various political parties. The race will be more intense in the two ‘biggest’ political parties, the ruling All Progressives Congress (APC) and the Peoples Democratic Party (PDP). In the PDP, the atmosphere is already charged as the battle for presidential ticket has already kicked off. Governor Ayodele Fayose of Ekiti State had, at Chelsea Hotel, in Abuja, publicly declared to run for the coveted office. Former governors Ibrahim Shekarau and Sule Lamido of Kano and Jigawa States, have also indicated interest to run, as former vice president Atiku Abubakar has also returned to the party with emerging indications that he would seek the ticket. Others likely to throw their hats into the ring are former governor of Kaduna State, Senator Ahmed Makarfi, former Senate President David Mark and former governor of Sokoto State, Attahiru Bafarawa. The emergence of Prince Uche Secondus as PDP national chairman has changed the equation as some analysts say Atiku’s chances are now shaky. In the ruling APC, most party leaders have considered President Muhammadu Buhari the only who could win for the party if given the ticket. But Mr President is yet to declare for a second term, despite his body language that has indicated he will. 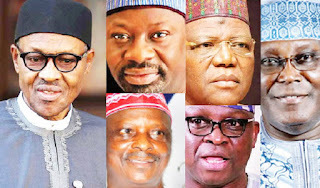 Daily Trust gathered that in the event Buhari declines, former governor of Kano State, Senator Rabiu Musa Kwankwaso, Governor Aminu Waziri Tambuwal of Sokoto State, Governor Nasir El-Rufai of Kaduna State, Governor Kashim Shettima of Borno State and Governor Rochas Okorocha of Imo State, will likely contest for the ticket. Judging from the political history of Nigeria, President Buhari will be adopted as the sole candidate of the ruling APC not minding the talks that the party would subject all presidential aspirants to primary election. Alhaji Shehu Shagari of the defunct National Party of Nigeria (NPN) got the second-term in 1983 through the adoption process. In 2011 and 2015, former President Goodluck Jonathan also got the PDP ticket despite what seemed to be a fierce contest with former Vice President Atiku Abubakar in 2011. Already, the APC governors have been canvassing for sole candidacy for Buhari. Surely, he will be given the opportunity of first refusal. Subtle presidential campaigns expected to focus on the nation’s key sectors and the general well-being of Nigerians in relation to achievements recorded by the present government and that of the PDP’s 16-year old reign will start in 2018. Political pundits say issues of security, anti-graft war, human rights and economy are likely to dominate campaigns with the two parties throwing all sorts at each other. While other political parties are also expected to field presidential candidates as well, it is clear that 2019 will be a straight battle between the APC and the PDP, considering that ‘small parties’ have failed to make significant impact at general elections over the years. The tenure of the APC National Working Committee (NWC) ends in June 2018. Under the current situation, the APC may have to organize one convention by May 2018 since the possibility of holding two separate conventions, non-elective and elective, may not be feasible because of cost. The non-elective convention which the party ought to have organized every two years may no longer be realizable since the compulsory elective one which holds every four years must be held by May next year. The ruling party must, as a matter of urgency, fast-track all activities towards conducting its much-anticipated convention which cannot be held any time later than June 13, 2018, the day the tenure of the current NWC members will expire. However, if the party leaders decide otherwise, the party may still organize two conventions. The implication of this is that the APC will hold a non-elective convention to endorse the amendment to the party’s constitution in the first quarter of 2018, while the elective one, which will produce successors to Chief John Odigie-Oyegun-led NWC, will be organized in the second quarter. Hence, the ruling party is expected to witness fresh and aggressive campaigns for the soon-to-be-vacant positions in the NWC in 2018. No doubt, the name of Governor Adams Oshiomhole may come up again as the possible successor to the APC national chairman, Chief Odigie-Oyegun. This will certainly be a battle. Another major battle is the ruling APC’s efforts at trying to reconcile with aggrieved members in 2018. Some members of the coalition that merged to form the party are still aggrieved over the treatment they have been receiving in the party, particularly the then nPDP which believes that his people have not been treated fairly. Already, the party has set up various reconciliation committees to address the internal strife. The fence-mending efforts will intensify in 2018. Engr. Segun Oni, the APC Deputy National Chairman, in an exclusive interview with Daily Trust, said that the differences in the party would be addressed. “In some cases, we have obtained reports (of reconciliation committees) and we will work on them,” Oni said. And work it will be indeed. The PDP has a herculean task of clearing its house by way of getting rid of all tendencies capable of jeopardising its chances in 2019, and those are legion. Most party leaders have identified imposition of candidates, impunity, disrespect for the party’s constitution, hate speech, jettisoning of the zoning formula and lack of cohesion as factors that led to the party’s humiliating defeat at the 2015 general polls. Freshly-minted PDP National Chairman, Prince Secondus, however, assured former national chairmen and Board of Trustees (BoT) members at Wadata Plaza that his tenure will not tolerate imposition and impunity. However, a chieftain of the party from the north, told Daily Trust that governors are still the problem of the party, because they are the ones funding it. “So, stopping impunity is difficult, and they always insist on having their way,” he said. Observers say nipping in the bud the new PDP faction which has named itself ‘Fresh PDP’, threatening to put in place a parallel NWC in early January, 2018. The party would have to address this. The party, pundits say, must work to ensure there are no factions. In addition, the likes of Prof. Taoheed Adedoja and Chief Pegba Otemolu, who are challenging the outcome of the convention at various courts, must be appeased. The Governor Seriake Dickson-led Reconciliation Committee is also working to reconcile all aggrieved aspirants. Five second-term governors, including Kashim Shettima of Borno State and Abdulaziz Yari of Zamfara State are said to be eyeing the Senate in the forthcoming 2019 general elections. The Senate has become a sort of ‘retirement home’ for governors on expiration of their second tenures. The tradition was entrenched in 2007 when second term governors practically bulldozed their ways there. At the moment, 14 former governors, namely Bukola Saraki, Rabiu Musa Kwankwaso, Aliyu Wamakko, Godswill Akpabio, Danjuma Goje, Abdullahi Adamu, Adamu Aliero, Joshua Dariye, Jonah Jang, Sam Egwu, Theodore Orji, George Akume, Ahmad Sani Yarima and Bukar Abba Ibrahim are at the Senate. The seats of some of the former governors in the Senate are being threatened by the ambitions of their successors, creating bad blood. 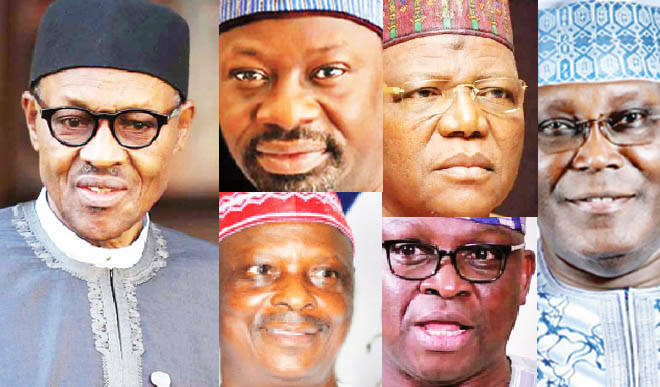 But Daily Trust has observed the body language of the second term governors, which suggest they are all out to retire to the Senate come 2019. The tenure of Governor Shettima, like all other second-term governors, elapses by May 29, 2019. Reports kept filtering round in the state on his intention to vie for the senatorial election. However, it is unclear whether Shettima, who is the chairman of the Northern Governors Forum will contest for Borno Central or North senatorial district. His recent statement that his father hailed from Gajiram in Guzamal local government area (LGA) of northern Borno, created the confusion. Yari who is a former member of the House of Reps is said to be eyeing the seat of Senator Yarima, his political godfather. Yarima presently occupies the Zamfara West senatorial district seat. Initially, there were reports that Yarima has resolved to hand over his seat to Yari. But it remains unclear. The eyes of the Kwara State governor, Abdulfatah Ahmed, are also said to be on the Senate. His ambition is common knowledge in Kwara political circles. Ahmed, a banker turned politician, is said to be eyeing the seat of Senator Rafiu Ibrahim of the Kwara South Senatorial District. If he succeeds, and the two present senators, Bukola Saraki and Shaaba Lafiagi of Kwara North senatorial district return to the upper chamber in 2019, it would mean that all the three senators of Kwara State would be former governors. It is common knowledge among the political heavyweights in Nasarawa State that the next move of Governor Umaru Tanko Al-Makura is heading into the Senate. He is said to be eyeing the seat of the Nasarawa South senatorial district being occupied by Senator Suleiman Adokwe of the PDP. The senatorial ambition of the Yobe State governor, Ibrahim Geidam, has set him against Senator Bukar Abba Ibrahim, who has been in the Senate since 2007. Geidam eyes Yobe East senatorial district, being occupied by Ibrahim, a former governor of Yobe. Recently, in an apparent reaction to the governor’s ambition, Senator Bukar Abba Ibrahim told his colleagues on the floor that he will be in the Senate for life. Senators and members of the House of Reps may move from one party to the other in order to secure a fresh ticket to return in 2019 if there is any threat to their ambition. Tongues are already wagging as to whether the Senate President, Bukola Saraki, and the former governor of Kano State, Rabiu Musa Kwankwaso will dump the APC for another political party in 2018. The defection reports of Kwankwaso are more pronounced than that of Saraki. But he has personally denied the report. Recently, his media aide, Binta Spikin, said her boss is not contemplating any idea to exit the APC. It is widely believed that if Kwankwaso decamps, many heavyweight politicians, especially in the House of Representatives will join him. Kwankwaso’s feud with his successor in Kano, Dr Abdullahi Umar Ganduje, has so far defied mediation efforts. As 2019 rolls along, all will become clear. Governor Ayo Fayose of Ekiti State, whose tenure ends on October 15, 2018, will get a successor in the coming new year. Already, the INEC has slated Ekiti governorship election for July 14, 2018. According to timetables of activities signed by the Secretary to the Commission, Mrs Augusta Ogakwu, the electoral body fixed April 15, 2018 for the commencement of campaigns, and April 16 for collection of forms. The conduct of party primaries, including resolution of disputes arising from the primaries had been scheduled to hold between April 15, 2018, and May 14, 2018, while last day for submission of forms had been fixed for May 15, 2018. Reports coming from the state reveal that the contest still remains between the ruling PDP and the opposition APC. Some say that the PDP may lose, following the adoption of the Deputy Governor by Governor Fayose and the disenchantment of some people towards the administration’s style of governance. Others, however, believe that the PDP may still win as long as Fayose calls the shots. Who will Osun’s cap fit? Osun State will get a new governor in 2018. The INEC has fixed September 22, 2018 for the governorship election in Osun State as the tenure of Governor Rauf Aregbresola ends in November 28, 2018. The notice of election will be issued on June 23, while campaign by political parties will commence on June 24 and end on September 20, 2018.